Put Life into the Party! Gag Birthday Gifts are some of the most fun gifts to give. They are a great way to lighten up the atmosphere . . . and get the party started! They should be selected with the birthday person in mind. If they're an avid runner - look for birthday gag gifts for runners. 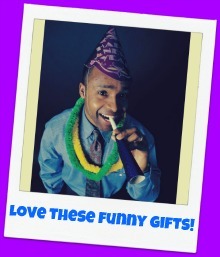 It's easy to choose gag birthday gifts for a politician or an attorney! But, you may need to be a little more creative in selecting a gag gift for a teacher or an accountant. What are their hobbies? Find gifts to match. Funny hats make great birthday gag gifts. Funny hats are the perfect dumb gift. If they're a Green Bay Packers fan . . . go for the cheese hat! If they're a fisherman - I'm sure they'd get a kick out of a big fish hat! They may never wear it outside the party, but you never know! I've seen people proudly wear some silly hats! Another idea is to personalize a hat to fit their personality! I showed this hat to my son, Eddie, and his friend. They both immediately wanted one! are cheap and fun to make. Here are a few ideas: go to your local $1 store. Get a prince or princess crown. Download free clip art and create a sign for the front of the crown like: Prince of baby poop (in the case of a new father! ), Ruler of (the universe), whatever would make them laugh! Add a wand for them to strut around with! You can also make a personalized photo gift - make sure you're create! 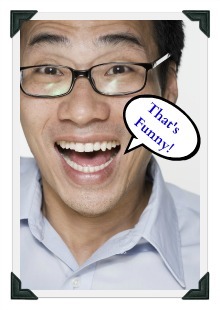 You can also get an old high school or grade school picture, frame it and add a funny caption. When they see that old picture, they'll really think it's funny! You can also take a similar picture and make a label for a bottle of beer and wine. Add something like: moonshine from the best or drink quick - turning to vinegar. #1st place for. . .
Be creative with your birthday gag gifts. . . have some fun and give them a trophy for it! If you're going to miss the birthday celebration, you can still get gag birthday gifts and send a funny personalized card.